Pokémon become local characters threat to "Yurukyara" Hikonyan and Kumamon? Source: Pokemon/Nintendo/Creatures Inc./GAME FREAK inc. TM and R are trademarks of Nintendo, Creatures Inc. and GAME FREAK inc.
Hikonyan, Kumamon, Kobaton, are the examples of the local characters"Yurukyara ( ゆるキャラ)" promoted by each region to attract tourists to the area. 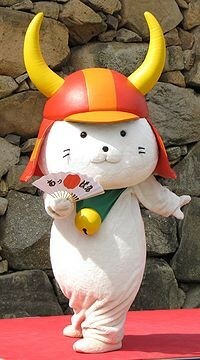 Hikonyan is from Hikone, Shiga (I used to live in Kusatsu, Shiga and wonder if Kusatsu also has one). New competition for these local characters may come from Pokemon. Some of Pokemon characters start co-promoting the areas of Japan. The co-promotion starts from 7 areas where Pokemon centers are currently located, namely Sapporo, Sendai, Tokyo, Yokohama, Nagoya, Osaka and Fukuoka. Pokemon local goods will be available soon. 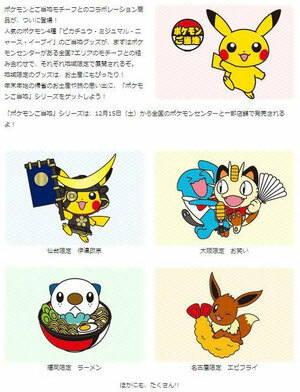 Pikachu is promoting Sendai with the costume of the old shogun- a military dictator- Date Masamune in the region, Eevee for Nagoya with Tempura shrimp, Meowth and Wobbuffet for Osaka and Oshawott for Fukuoka with Ramen noodle. Are these localized Pokemon threatening the popularity of the Yurukyara? Well, the answer is probably No. Local Hello Kitty such s Hello Kitty in Kimono etc. 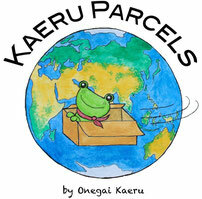 has been very much available in major tourist area. And most importantly the supporting fan base for Pokemon and Yurukyara is pretty much different. The Pokemon fan in Japan tend to be young and the fan for Yurukyara tend be old. Hopefully Pokemon and Yurukyara both will have synergy to bring more tourists to each regions! And, by the way, talking of Pokemon, if you are in NYC now, you will see a big Pikachu baloon for Macy's Thanksgiving Day Parade on 22nd of November. Do not miss it!